Direct oil fired heaters are highly efficient devices that provide large volumes of instant heat where it is required. They are best for open or well ventilated areas like factories, warehouses or construction sites. 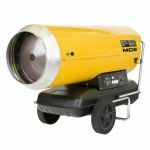 MCS direct heaters are known as very efficient and robust as well as safe and easy in use.